I find seafood to be a very daring choice to serve to guests. People often do not like seafood or are very picky in the way that it’s prepared. 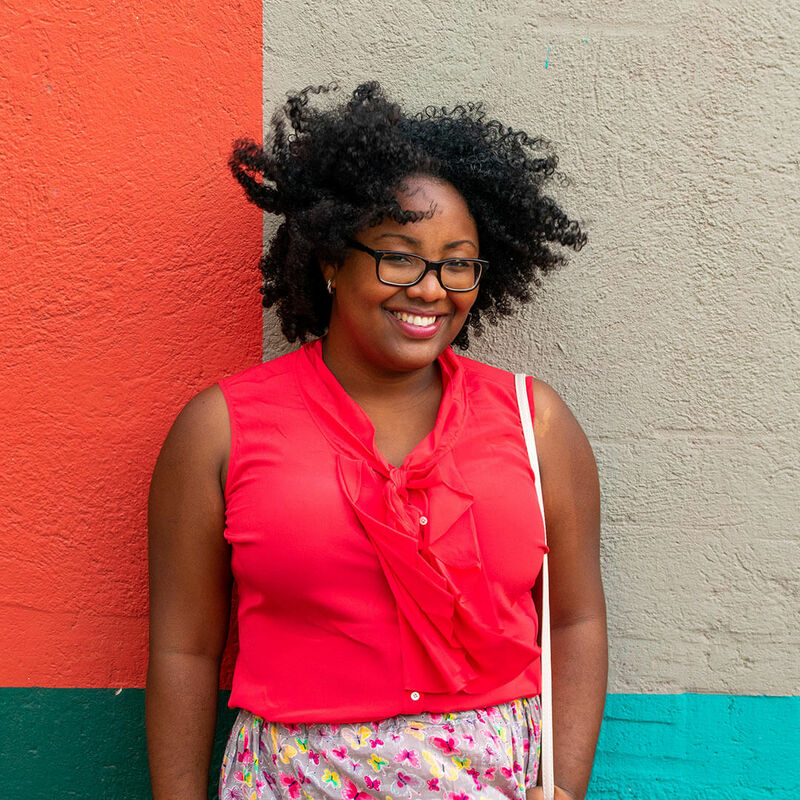 But, what would life be if we don’t take risks? 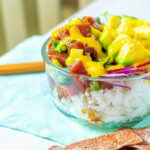 If you have someone who does like to eat fish then I recommend making this tuna poké bowl. You just can’t go wrong with this recipe. I used to be one of those people that didn’t like eating fish. I grew up around water, but I rarely chose to have fish for dinner. Red Snapper is popular local fish here on Curaçao and it was also the only type of fish that I ate growing up. But, it had to be made the way I wanted or I would still not eat it. My mom still tells the story of how I would only eat Red Snapper if it was made by her or my grandmother. Somehow no one could really make Red Snapper as they did, not even my father—even though he’d like to think otherwise. It wasn’t until last year that my palate started growing up and I was becoming more receptive of new dishes. Perhaps when you turn 25 your taste buds finally start to appreciate the finer things in life. The first time I had fresh raw tuna was a year ago when I tried a tuna tartar. One bite and I was in love. Living on Curaçao gives me the opportunity to buy really good fresh tuna for a fair price. 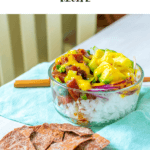 So, I felt obliged to make something delicious with tuna and since poké bowls are all the rage lately, I created this tuna poké bowl. 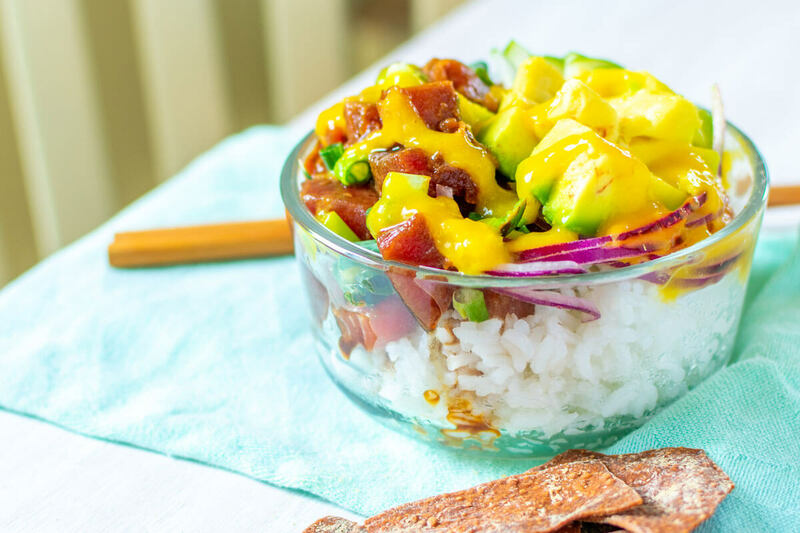 What I love about poké bowls the most is you can tweak it to your liking. 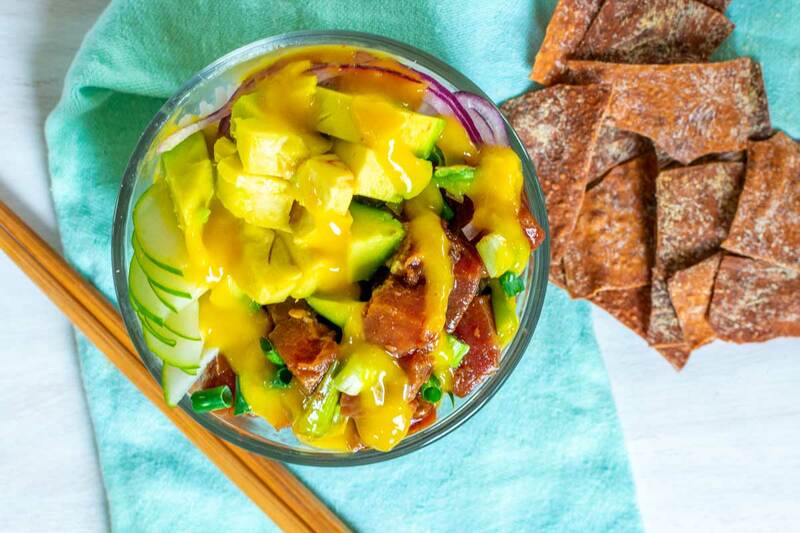 My tuna poké bowl has—of course—fresh tuna, red onions, cucumbers, and avocado. 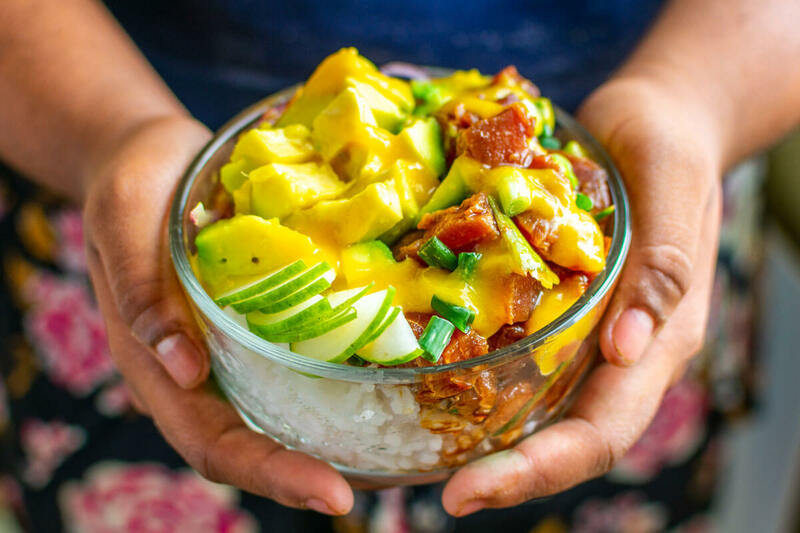 But, what really makes this dish feel like you’ve gone to heaven and back is the Asian-mango dressing. It just complements the dish, adds a little sweetness to the rather salty ingredients, and puts everything together. Perfect doesn’t come even close to what I felt when I took a bite out of this dish. I am sure that you, and whoever you serve this dish to, will feel the same. 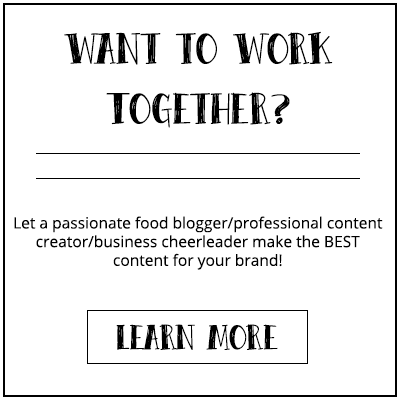 You are basically recreating a popular restaurant in the comfort of your own home and for a fraction of a normal meal in a restaurant. I had some leftover wonton chips that I added to the dish, but this is completely optional. 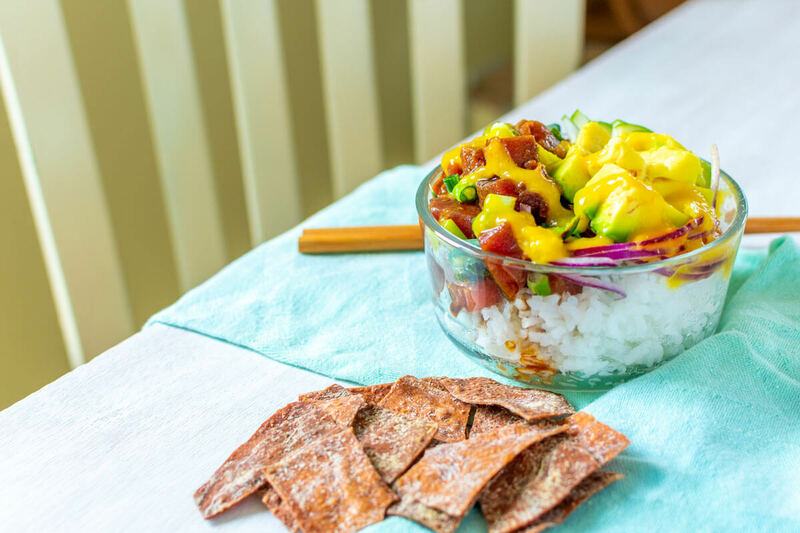 A tasty tuna poké bowl with Asian-mango dressing, red onions, cucumbers, and avocado. Start with the dressing. Add all the ingredients, except the water, into a food processor. Gradually add water, while the processor is running, until the sauce becomes runny but still a little bit thick. Mix the tuna and the Asian dressing in a bowl, mix, and set aside. Add the cooked rice in a serving bowl and add the tuna on top. Add a few slices of onion, cucumbers, avocado, and some green onions all over. Drizzle the dressing on top. You can find the recipe for the Asian dressing here.